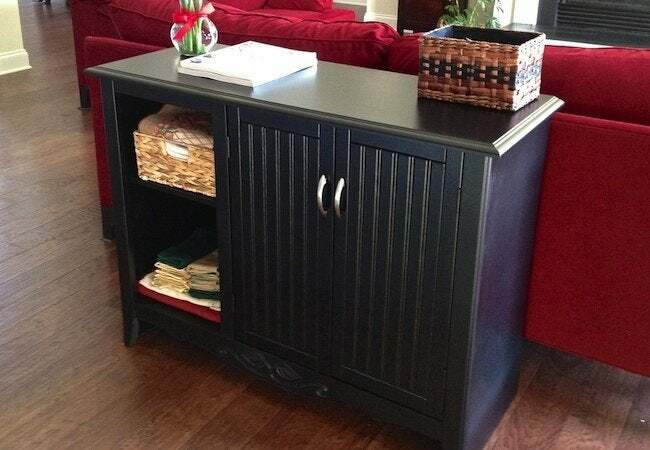 You can revitalize almost any piece of furniture with a few coats of spray paint. And once you've got the technique down, you'll be surprised at how easy—and addictive—spray-painting can be! 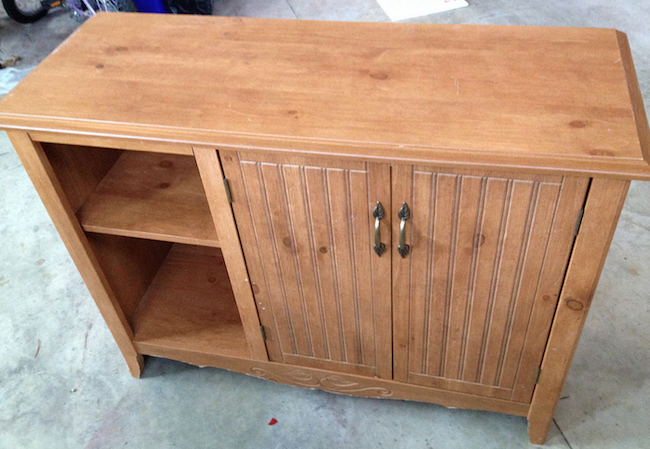 Is there a dated, shabby, worn-out cabinet hogging space somewhere in your home? If so, you may feel tempted to get rid of the old eyesore. But if the only thing you don’t like about the furniture is the way that it looks—if it’s unlovely but perfectly functional—bear in mind that you can completely transform the cabinet quickly, easily, and inexpensively. Yes! The key: spray paint. Invest in one or two cans of spray paint; spend an hour or two on the makeover, depending on the size of your cabinet; and you’ll be amazed (I certainly was) by the difference. Best of all, the project costs a mere fraction of what it would to purchase a brand-new cabinet. Whenever you’re spray-painting furniture, it’s recommended that you work in a well-ventilated area. On a nice day, you might even choose to work outside, provided there’s little to no wind. (You don’t want gusts to blow yard debris onto your project during the drying stage.) Another benefit of painting in the driveway or backyard is that you don’t need to worry about overspray. Working indoors? Open the windows and use drop cloths to cover anything you wish to protect from the spray paint. Now that you’ve readied your work area, the next step is to prepare the piece of furniture you’re going to spray-paint. First things first, remove all hardware (for example, hinges or handles) and set it safely aside. Next—this is optional—fill any scratches or holes with wood filler, closely following the directions from the product manufacturer. Finally, sand down the furniture, not only to even out nicked edges, but also to give the spray paint an accommodating surface to which it can adhere easily. Once you’ve finished sanding, wipe the furniture with either a tack cloth or a damp cotton rag. Wait for the piece to dry completely before proceeding to paint. Don the appropriate protective gear—in this case, a dust mask (spray-paint particulates are very fine and can be accidentally inhaled) and safety gloves (well, these kinds of projects are known to get a little messy on occasion). I used Rust-Oleum’s Universal spray paint. Because it works on any surface, I was able to use it on both the wood and the metal cabinet hinges. Another plus: It can be sprayed from any angle—handy if you need to reach into corners. 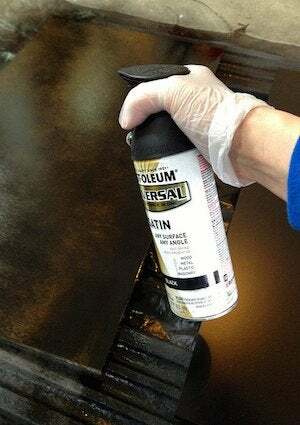 Whenever I spray-paint furniture, I apply several thin coats instead of a single heavy coat. That strategy has seemed to yield the best results. Holding the can 8 to 12 inches from the surface, pull the trigger on the spray-paint can, applying the paint with a sweeping motion. As you go along, let the spray fall a few inches past the left and right edges of the furniture. Remember that spray paint dries quickly; subsequent coats can be added within two hours. For further details about application, be sure to read the instructions provided by the manufacturer. Give the paint at least 24 hours to cure fully before reinstalling hardware or placing any objects on or inside of the furniture. That may seem like a long time to wait, but personally I’d wait five times as long if it meant revitalizing a cabinet that I would have otherwise hauled to the Dumpster. Spray paint really is an amazing thing. With a little practice, you’ll be able to spray-paint like a pro. And then if you’re anything like me, you’ll look at the world in a new way, always finding things around the house to revamp and totally renew. This post has been brought to you by Rust-Oleum. Its facts and opinions are those of BobVila.com.